Neural coding deals with the problem on how neurons or a network of neurons processes a stimulus and creates a response in form of electrical action potentials. Information then might be encoded in the rate of the action potentials or their timing. Do nerves, e.g. in the arm of a human, merely "relay" any information, or do they also process incoming signals in any way? As a result, the electrical signal would then differ when measured at the beginning and the end of a nerve. Can a nerve be stimulated at one point with a certain electrical signal as input (with varying rate etc. to encode information) and can the output be measured at another point? If I understood correctly, this is done at a electroneuronography (ENoG) only that the electrical stimulus is not varying in rate or other properties. Any links to research that deals with similar things would be great. Peripheral nerves can be stimulated by, e.g., electrical pulses and their responses can be recorded back by using recording electrodes. Peripheral nerves generally do not process the signal. However, they can, and likely will, behave in a nonlinear manner, meaning that their transfer characteristics may change over time, depending on the stimulus. I'll approach this question based on the cochlear implant (CI). 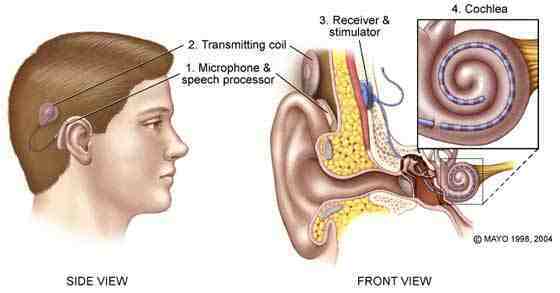 In short, these devices are implanted into the inner ear in people with pronounced hearing loss (Fig. 1). CIs stimulate the auditory nerve directly with electrical pulses, thereby bypassing the degenerate hair cells and restoring functional hearing. 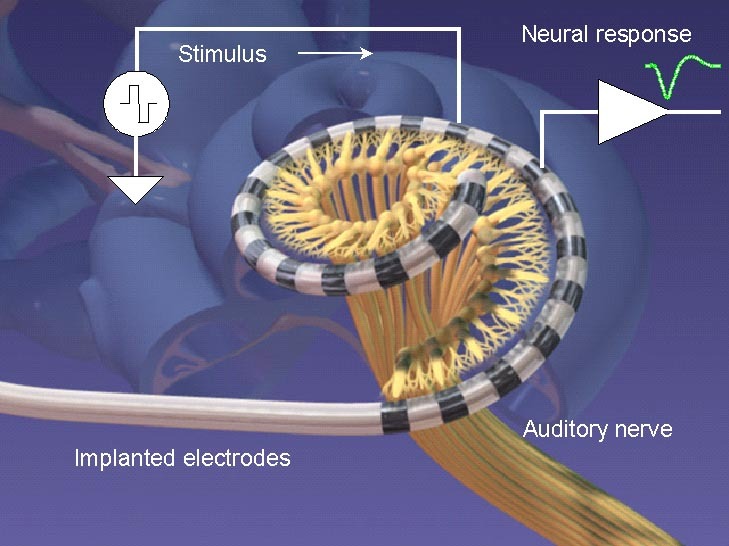 The auditory nerve responses elicited by CIs are routinely recorded to assess implant functionality. These recordings are called electrically evoked compound action potential (eCAP) responses (Fig. 2). Basically, one electrode is stimulated and the nerve response is measured by another electrode. All the action potentials of the individual auditory nerve fibers are basically recorded synchronously, resulting in a compound action potential (CAP). This will probably answer your second question, namely yes, nerve responses can be elicited electrically and recorded back with the proper recording setup. To go back to your first question - nerve responses are nonlinear, as neural responses show adaptation to the stimulation. Basically, nerves get tired of firing after a while. To go back to the CI example; if high rates of electrical stimuli are applied to the inner ear, the auditory nerve shows a slow adaptive behavior, causing the nerve response amplitude to decline slowly over time, this is caused because more and more fibers become less responsive. Then there is a short-term effect caused by refractoriness of individual fibers. A few milliseconds after a fiber has fired, it is unresponsive to a following stimulus. This causes some fibers to skip the stimulus. During a high-rate pulse train, this results in e eCAP to alternatingly have a normal and low amplitude (Fig. 3). This answers your first question, in a nutshell, namely that nerves can alter the input signal for sure. The process of adaptatin is widespread in the periphery, for example all sensory systems show it to some degree. It is, however, not a real processing such as the processing happening in the peripheral retina for example where complex circuitry markedly alters retinal output to the optic nerve. No. Central neurons predominately process information through neural networks. A neural network is basically a group of neurons who have synapses on each other thereby providing excitatory and inhibitory inputs. The peripheral nervous system is generally thought of as being a relay between the periphery (e.g., limbs) and the brain. They do not generally form synapses with neurons outside the CNS and therefore cannot perform processing like neurons in the CNS. At the individual neuron level the "signal" is generally thought of as being an action potential. Action potentials are typically described as all-or-none events and propagate along the nerve fiber. The exact morphology of the action potential can change as it propagates, but when it gets to the end, it will cause the release of neurotransmitter to signal the next neuron. An alternative definition of "signal" are post synaptic potentials. These are the small changes in voltage that a nerve fiber undergoes do to the presence of neurotransmitters. The Hodgkin and Huxley model provides a mathematical description of how this process works. No (well maybe). Stimulating a nerve at a particular point is difficult. Hodgkin and Huxley in their Nobel prize winning work injected current (maybe voltage) into the giant axon of the squid and measured the response. The technique of intracellular recordings involves patch clamping and is not easy (again a Nobel prize worthy discovery). Patch clamping a cell in two places is probably theoretically possible, but I pity the grad student who has to do it. With extracellular recordings it is difficult to know "where" you are stimulating and recording. It is often hard to even know what neuron you are recording from. Not the answer you're looking for? Browse other questions tagged neuroscience measurement neurophysiology electrophysiology experimental-neuroscience or ask your own question. Diagram of the peripheral nervous system of different animals? Does the retina encode visual information like a Bitmap or an SVG?